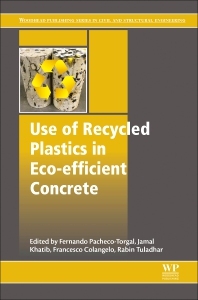 Use of Recycled Plastics in Eco-efficient Concrete looks at the processing of plastic waste, including techniques for separation, the production of plastic aggregates, the production of concrete with recycled plastic as an aggregate or binder, the fresh properties of concrete with plastic aggregates, the shrinkage of concrete with plastic aggregates, the mechanical properties of concrete with plastic aggregates, toughness of concrete with plastic aggregates, modulus of elasticity of concrete with plastic aggregates, durability of concrete with plastic aggregates, concrete plastic waste powder with enhanced neutron radiation shielding, and more, thus making it a valuable reference for academics and industrial researchers. Well edited and good reference for understanding of recycled polymers. Jamal Khatib is a Professsor of Civil Engineering (Construction Materials) in the Faculty of Science and Engineering at the University of Wolverhampton, UK. His research interests are mainly in the area of sustainable construction/structural materials subjected to different environmental conditions, and the use of waste and novel materials in construction applications.